Six residents of Ni’lin and a Danish solidarity activist were injured today by Israeli forces as they demonstrated against the construction of the apartheid wall in the village of Ni’lin. One American solidarity activist was also arrested as the demonstration was coming to an end. 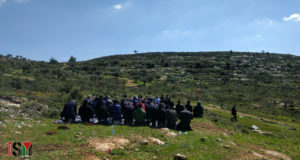 Immediately after a group of 300 Palestinians, accompanied by 25 Israeli and international activists, gathered for a weekly Friday prayer the army began to fire tear gas at those who attempted to enter their land. The canisters being fired were shot directly at the demonstrators, an act which caused multiple of the seven injuries. As the demonstration continued tear gas was not only fired at the Palestinians and internationals attempting to enter the land but also into the village of Ni’lin, away from the demonstration. During the four hour demonstration rubber bullets and sound bombs were also used by the Israeli army. 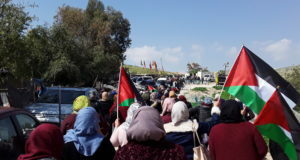 The Palestinians gathered in this weekly demonstration to attempt to cross their land towards the construction site of the illegal apartheid wall which would annex another 40% of Ni’lin’s land accumulating a loss of around 85% of it’s land since 1948. The Danish solidarity activist, was taken immediately for treatment in Ramallah after having being shot from close range by Israeli forces with tear-gas cannisters, in the arm. she required 15 stitches to her arm as well as being treated for shock. The six injured Palestinians, one of which was hit in the head with a tear gas canister and badly wounded, were all treated at the local clinic. The American activist was detained by the Israeli forces and remains in custody.